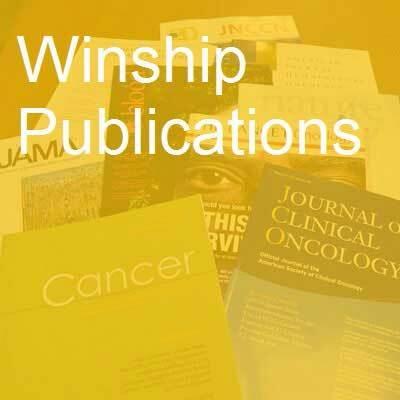 Various first authors and senior authors from Winship Cancer Institute have published 76 studies in major medical and scientific journals in the past month. Authors' Reply to Gandjour: "The Role of Chronic Disease, Obesity, and Improved Treatment and Detection in Accounting for the Rise in Healthcare Spending Between 1987 and 2011". Thorpe KE, Allen L, Joski P. Applied health economics and health policy. 2016; PubMed PMID: 26914552. Implications of Lymphatic Transport to Lymph Nodes in Immunity and Immunotherapy. Thomas SN, Rohner NA, Edwards EE. Annual review of biomedical engineering. 2016; PubMed PMID: 26928210. Metabolic profiling during HIV-1 and HIV-2 infection of primary human monocyte-derived macrophages. Hollenbaugh JA, Montero C, Schinazi RF, Munger J, Kim B. Virology. 2016; 491:106-114. PubMed PMID: 26895248. Expectant management of veterans with early-stage prostate cancer. Filson CP, Shelton JB, Tan HJ, Kwan L, Skolarus TA, Saigal CS, Litwin MS. Cancer. 2016; 122(4):626-33. PubMed PMID: 26540451. Margins for cervical and vulvar cancer. Khanna N, Rauh LA, Lachiewicz MP, Horowitz IR. Journal of surgical oncology. 2016; PubMed PMID: 26852901. Inhibition of mTOR complex 2 induces GSK3/FBXW7-dependent degradation of sterol regulatory element-binding protein 1 (SREBP1) and suppresses lipogenesis in cancer cells. Li S, Oh YT, Yue P, Khuri FR, Sun SY. Oncogene. 2016; 35(5):642-50. PubMed PMID: 25893295; PubMed Central PMCID: PMC4615269. Monoclonal Antibodies for the Treatment of Myeloma: Targeting SLAMF7 and CD38. Lonial S. Cancer journal (Sudbury, Mass.). 2016; 22(1):3-6. PubMed PMID: 26841009. Reactions to smoke-free public policies and smoke-free home policies in the Republic of Georgia: results from a 2014 national survey. Berg CJ, Topuridze M, Maglakelidze N, Starua L, Shishniashvili M, Kegler MC. International journal of public health. 2016; PubMed PMID: 26841891. Cytopathologic diagnosis of oncocytic type intraductal papillary mucinous neoplasm: Criteria and clinical implications of accurate diagnosis. Reid MD, Stallworth CR, Lewis MM, Akkas G, Memis B, Basturk O, Adsay V. Cancer cytopathology. 2016; 124(2):122-34. PubMed PMID: 26415076. Fatigue is associated with inflammation in patients with head and neck cancer before and after intensity-modulated radiation therapy. Xiao C, Beitler JJ, Higgins KA, Conneely K, Dwivedi B, Felger J, Wommack EC, Shin DM, Saba NF, Ong LY,Kowalski J, Bruner DW, Miller AH. Brain, behavior, and immunity. 2016; 52:145-52. PubMed PMID: 26515035. Do partial home smoking bans signal progress toward a smoke-free home? Kegler MC, HaardÃ¶rfer R, Bundy LT, Escoffery C, Berg CJ, Fernandez M, Williams R, Hovell M. Health education research. 2016; 31(1):24-35. PubMed PMID: 26661723. Non-canonical actions of mismatch repair. Crouse GF. DNA repair. 2016; 38:102-9. PubMed PMID: 26698648; PubMed Central PMCID: PMC4740236. International Society for Cellular Therapy perspective on immune functional assays for mesenchymal stromal cells as potency release criterion for advanced phase clinical trials. Galipeau J, Krampera M, Barrett J, Dazzi F, Deans RJ, DeBruijn J, Dominici M, Fibbe WE, Gee AP, Gimble JM, Hematti P, Koh MB, LeBlanc K, Martin I, McNiece IK, Mendicino M, Oh S, Ortiz L, Phinney DG, Planat V, Shi Y, Stroncek DF, Viswanathan S, Weiss DJ, Sensebe L. Cytotherapy. 2016; 18(2):151-9. PubMed PMID: 26724220; PubMed Central PMCID: PMC4745114. Alcohol Consumption and Urinary Estrogens and Estrogen Metabolites in Premenopausal Women. Hartman TJ, Sisti JS, Hankinson SE, Xu X, Eliassen AH, Ziegler R. Hormones & cancer. 2016; 7(1):65-74. PubMed PMID: 26728472; PubMed Central PMCID: PMC4729640. Autosomal Dominant Retinal Dystrophies Caused by a Founder Splice Site Mutation, c.828+3A>T, in PRPH2 and Protein Haplotypes in trans as Modifiers. Shankar SP, Hughbanks-Wheaton DK, Birch DG, Sullivan LS, Conneely KN, Bowne SJ, Stone EM, Daiger SP. Investigative ophthalmology & visual science. 2016; 57(2):349-59. PubMed PMID: 26842753; PubMed Central PMCID: PMC4736744. Small-Cell Lung Cancer: New Directions for Systemic Therapy. Ramalingam SS. Journal of oncology practice / American Society of Clinical Oncology. 2016; 12(2):119-20. PubMed PMID: 26869648. Association Between Causal Beliefs and Shoe Wearing to Prevent Podoconiosis: A Baseline Study. Ayode D, Tora A, Farrell D, Tadele G, Davey G, McBride CM. The American journal of tropical medicine and hygiene. 2016; PubMed PMID: 26928843. A General Approach for Generating Fluorescent Probes to Visualize Piconewton Forces at the Cell Surface. Chang Y, Liu Z, Zhang Y, Galior K, Yang J, Salaita K. Journal of the American Chemical Society. 2016; PubMed PMID: 26871302. Deep Neck Fibromatosis After Diskectomy and Cervical Fusion: Case Series and Review of the Literature. Lacayo EA, Glastonbury CM, Hoang JK, Magliocca KR, Hill KL, Hudgins PA. AJR. American journal of roentgenology. 2016; :1-5. PubMed PMID: 26914791. Low Anti-Mullerian Hormone in Pediatric Cancer Survivors in the Early Years Following Gonadotoxic Therapy. Elchuri SV, Patterson BC, Brown M, Bedient C, Record E, Wasilewski-Masker K, Mertens AC, Meacham LR. Journal of pediatric and adolescent gynecology. 2016; PubMed PMID: 26924632. A new flexible dependence measure for semi-competing risks. Yang J, Peng L. Biometrics. 2016; PubMed PMID: 26916804. Determinants of racial differences in survival for sinonasal cancer. Patel ZM, Li J, Chen AY, Ward KC. The Laryngoscope. 2016; PubMed PMID: 26915596. Tuberculosis Verrucosa Cutis Lesions Exhibit a Greater Microvessel Count than Lupus Vulgaris Lesions. Bhandarkar SS, Lanka P, Lanka LR, Veledar E, Bonner MY, MacKelfresh J, Arbiser JL. Experimental dermatology. 2016; PubMed PMID: 26896643. Hyperthyroidism in HIV patients on combined antiretroviral therapy: Case series and literature review. Hsu E, Phadke V, Nguyen ML. AIDS research and human retroviruses. 2016; PubMed PMID: 26887978. Drosophila Brat and human ortholog TRIM3 maintain stem cell equilibrium and suppress brain tumorigenesis by attenuating Notch nuclear transport. Mukherjee S, Tucker-Burden C, Zhang C, Moberg K, Read R, Hadjipanayis C, Brat DJ. Cancer research. 2016; PubMed PMID: 26893479. Phosphorylated Bcl-2 and Mcl-1 as prognostic markers in small cell lung cancer. Chowdry RP, Sica GL, Kim S, Chen Z, Goodman A, Alexis D, Deng X, Owonikoko TK. Oncotarget. 2016; PubMed PMID: 26908449. Programmable DNA Hydrogels Assembled from Multi-Domain DNA Strands. Jiang H, Pan V, Vivek S, Weeks ER, Ke Y. Chembiochem : a European journal of chemical biology. 2016; PubMed PMID: 26888015. ATRIP Deacetylation by SIRT2 Drives ATR Checkpoint Activation by Promoting Binding to RPA-ssDNA. Zhang H, Head PE, Daddacha W, Park SH, Li X, Pan Y, Madden MZ, Duong DM, Xie M, Yu B, Warren MD, Liu EA, Dhere VR, Li C, Pradilla I, Torres MA, Wang Y, Dynan WS, Doetsch PW, Deng X, Seyfried NT, Gius D, Yu DS. Cell reports. 2016; 14(6):1435-47. PubMed PMID: 26854234; PubMed Central PMCID: PMC4758896. Two Case Reports of Nodular Fasciitis: A Newly Recognized Placental Lesion. Willis BC, Archer SR, Shahid R, Khoshnam N, Shinnick J, Lou LH, Hearn KE, Ilse AM, Rizk C, Thompson L, Gilbert-Barness E, Shehata BM. Fetal and pediatric pathology. 2016; :1-5. PubMed PMID: 26882130. Phase I Study of the Investigational NEDD8-Activating Enzyme Inhibitor Pevonedistat (TAK-924/MLN4924) in Patients with Advanced Solid Tumors. Sarantopoulos J, Shapiro GI, Cohen RB, Clark JW, Kauh JS, Weiss GJ, Cleary JM, Mahalingam D, Pickard MD, Faessel HM, Berger AJ, Burke K, Mulligan G, Dezube BJ, Harvey RD. Clinical cancer research : an official journal of the American Association for Cancer Research. 2016; 22(4):847-57. PubMed PMID: 26423795. Spontaneous defects between the mastoid and posterior cranial fossa. Rereddy SK, Mattox DE. Acta oto-laryngologica. 2016; :1-4. PubMed PMID: 26878278. Utility of folate receptor alpha immunohistochemistry in cytology specimens of metastatic breast carcinoma, metastatic serous carcinoma of MÃ¼llerian origin, and primary lung adenocarcinoma. Sheikh UN, Cohen C, Siddiqui MT. Diagnostic cytopathology. 2016; PubMed PMID: 26875861. Impact of neck failure on survival in older patients with differentiated thyroid cancer. Marcus DM, Jiang R, Ward KC, Higgins KA, Saba NF, Wadsworth JT, Beitler JJ. Head & neck. 2016; PubMed PMID: 26874073. Deletion of Na+/H+ exchanger regulatory factor 2 represses colon cancer progress by suppression of Stat3 and CD24. Yoshida M, Zhao L, Grigoryan G, Shim H, He P, Yun CC. American journal of physiology. Gastrointestinal and liver physiology. 2016; :ajpgi.00419.2015. PubMed PMID: 26867566. Melanoma growth effects on molecular clearance from tumors and biodistribution into systemic tissues versus draining lymph nodes. Rohner NA, Thomas SN. Journal of controlled release : official journal of the Controlled Release Society. 2016; 223:99-108. PubMed PMID: 26721446; PubMed Central PMCID: PMC4724472. LKB1 kinase-dependent and -independent defects disrupt polarity and adhesion signaling to drive collagen remodeling during invasion. Konen J, Wilkinson S, Lee B, Fu H, Zhou W, Jiang Y, Marcus AI. Molecular biology of the cell. 2016; PubMed PMID: 26864623. Calcium intake and mortality from all causes, cancer, and cardiovascular disease: the Cancer Prevention Study II Nutrition Cohort. Yang B, Campbell PT, Gapstur SM, Jacobs EJ, Bostick RM, Fedirko V, Flanders WD, McCullough ML. The American journal of clinical nutrition. 2016; PubMed PMID: 26864361. Limits to the precision of gradient sensing with spatial communication and temporal integration. Mugler A, Levchenko A, Nemenman I. Proceedings of the National Academy of Sciences of the United States of America. 2016; 113(6):E689-95. PubMed PMID: 26792517. Measuring the spatial correlations of protein binding sites. Wei Y, Wu H. Bioinformatics (Oxford, England). 2016; PubMed PMID: 26861822. Honokiol bis-dichloroacetate (Honokiol DCA) demonstrates activity in vemurafenib-resistant melanoma in vivo. Bonner MY, Karlsson I, Rodolfo M, Arnold RS, Vergani E, Arbiser JL. Oncotarget. 2016; PubMed PMID: 26871475. Cellular softening mediates leukocyte demargination and trafficking, thereby increasing clinical blood counts. Fay ME, Myers DR, Kumar A, Turbyfield CT, Byler R, Crawford K, Mannino RG, Laohapant A, Tyburski EA, Sakurai Y, Rosenbluth MJ, Switz NA, Sulchek TA, Graham MD, Lam WA. Proceedings of the National Academy of Sciences of the United States of America. 2016; PubMed PMID: 26858400. Omacetaxine Mepesuccinate for Chronic Myeloid Leukemia. Rosshandler Y, Shen AQ, Cortes J, Khoury HJ. Expert review of hematology. 2016; PubMed PMID: 26853281. Characterization of a Linked Jumonji Domain of the KDM5/JARID1 Family of Histone H3 Lysine 4 Demethylases. Horton JR, Engstrom A, Zoeller EL, Liu X, Shanks JR, Zhang X, Johns MA, Vertino PM, Fu H, Cheng X. The Journal of biological chemistry. 2016; 291(6):2631-46. PubMed PMID: 26645689. A novel method for estimating transgender status using electronic medical records. Roblin D, Barzilay J, Tolsma D, Robinson B, Schild L, Cromwell L, Braun H, Nash R, Gerth J, Hunkeler E, Quinn VP, Tangpricha V, Goodman M. Annals of epidemiology. 2016; PubMed PMID: 26907539. Advancing methods for US transgender health research. Reisner SL, Deutsch MB, Bhasin S, Bockting W, Brown GR, Feldman J, Garofalo R, Kreukels B, Radix A, Safer JD, Tangpricha V, TÊ¼Sjoen G, Goodman M. Current opinion in endocrinology, diabetes, and obesity. 2016; PubMed PMID: 26845331. Simultaneous Activation of Induced Heterodimerization between CXCR4 Chemokine Receptor and Cannabinoid Receptor 2 (CB2) Reveal a Mechanism for Regulation of Tumor Progression. Coke CJ, Scarlett KA, Chetram MA, Jones KJ, Sandifer BJ, Davis AS, Marcus AI, Hinton CV. The Journal of biological chemistry. 2016; PubMed PMID: 26841863. Lycopene, tomato products and prostate cancer-specific mortality among men diagnosed with nonmetastatic prostate cancer in the Cancer Prevention Study-II Nutrition Cohort. Wang Y, Jacobs EJ, Newton CC, McCullough ML. International journal of cancer. Journal international du cancer. 2016; PubMed PMID: 26830232. Suppurative Granulomatous Cholecystitis in a Pediatric Chronic Carrier with Salmonella enterica serotype Typhi: A Case Report and Review of Literature. Herman HK, Hampshire KN, Khoshnam N, Khan AA, Jerris R, Abramowsky CR, Shehata BM. Fetal and pediatric pathology. 2016; :1-4. PubMed PMID: 26838767. Association of childhood trauma with fatigue, depression, stress, and inflammation in breast cancer patients undergoing radiotherapy. Han TJ, Felger JC, Lee A, Mister D, Miller AH, Torres MA. Psycho-oncology. 2016; 25(2):187-93. PubMed PMID: 25976322. Pilot Study Evaluating Efficacy of 2 Regimens for Hypovitaminosis D Repletion in Pediatric Inflammatory Bowel Disease. Simek RZ, Prince J, Syed S, Sauer CG, Martineau B, Hofmekler T, Freeman AJ, Kumar A, McElhanon BO, Schoen BT, Tenjarla G, McCracken C, Ziegler TR, Tangpricha V, Kugathasan S. Journal of pediatric gastroenterology and nutrition. 2016; 62(2):252-8. PubMed PMID: 26196201. Excising Additional Margins at Initial Breast-Conserving Surgery (BCS) Reduces the Need for Re-excision in a Predominantly African American Population: A Report of a Randomized Prospective Study in a Public Hospital. Jones V, Linebarger J, Perez S, Gabram S, Okoli J, Bumpers H, Burns B, Mosunjac M, Rizzo M. Annals of surgical oncology. 2016; 23(2):456-64. PubMed PMID: 26254169. Hypothalamic-pituitary sarcoidosis with vision loss and hypopituitarism: case series and literature review. Anthony J, Esper GJ, Ioachimescu A. Pituitary. 2016; 19(1):19-29. PubMed PMID: 26267304. Endoscopic mucosal ablation and over-the-scope clipping for fistula closure. Clermont MP, Fernandez FG, Willingham FF. Gastrointestinal endoscopy. 2016; 83(2):452. PubMed PMID: 26284743. A regenerative microchannel device for recording multiple single-unit action potentials in awake, ambulatory animals. Srinivasan A, Tipton J, Tahilramani M, Kharbouch A, Gaupp E, Song C, Venkataraman P, Falcone J, Lacour SP, Stanley GB, English AW, Bellamkonda RV. The European journal of neuroscience. 2016; 43(3):474-85. PubMed PMID: 26370722. Roles of adjuvant and salvage radiotherapy for desmoplastic melanoma. Oliver DE, Patel KR, Switchenko J, Parker D, Lawson DH, Delman KA, Kudchadkar RR, Khan MK. Melanoma research. 2016; 26(1):35-41. PubMed PMID: 26397051. Another look at the informed consent process: The document and the conversation. Wall LK, Pentz RD. Cancer. 2016; 122(3):352-4. PubMed PMID: 26505483. High-speed DNA-based rolling motors powered by RNase H. Yehl K, Mugler A, Vivek S, Liu Y, Zhang Y, Fan M, Weeks ER, Salaita K. Nature nanotechnology. 2016; 11(2):184-90. PubMed PMID: 26619152. Nanoscale optomechanical actuators for controlling mechanotransduction in living cells. Liu Z, Liu Y, Chang Y, Seyf HR, Henry A, Mattheyses AL, Yehl K, Zhang Y, Huang Z, Salaita K. Nature methods. 2016; 13(2):143-6. PubMed PMID: 26657558; PubMed Central PMCID: PMC4732909. Perfluorooctanoic acid and chronic kidney disease: Longitudinal analysis of a Mid-Ohio Valley community. Dhingra R, Lally C, Darrow LA, Klein M, Winquist A, Steenland K. Environmental research. 2016; 145:85-92. PubMed PMID: 26656498. Is there a role for PET/CT parameters to differentiate thyroid cartilage invasion from penetration? Kendi AT, Corey A, Magliocca KR, Galt JR, Zhang C, Chen Z, Higgins K, Beitler JJ, Wadsworth JT, El-Deiry MW, Schuster DM, Saba NF,Hudgins PA. European journal of radiology. 2016; 85(2):319-23. PubMed PMID: 26781136. Nodal Upstaging Is More Common with Thoracotomy than with VATS During Lobectomy for Early-Stage LungÂ Cancer: An Analysis from the National Cancer Data Base. Medbery RL, Gillespie TW, Liu Y, Nickleach DC, Lipscomb J, Sancheti MS, Pickens A, Force SD, Fernandez FG. Journal of thoracic oncology : official publication of the International Association for the Study of Lung Cancer. 2016; 11(2):222-33. PubMed PMID: 26792589; PubMed Central PMCID: PMC4729646. Persistent cough, chest pain, and dyspnea in a young man. Shuaib W, Shahzad H, Rehman A, Alweis R, Stettner EA, Lall MD, Khosa F. JAAPA : official journal of the American Academy of Physician Assistants. 2016; 29(2):47-9. PubMed PMID: 26818646. Acetylation of Aurora B by TIP60 ensures accurate chromosomal segregation. Mo F, Zhuang X, Liu X, Yao PY, Qin B, Su Z, Zang J, Wang Z, Zhang J, Dou Z, Tian C, Teng M, Niu L, Hill DL, Fang G, Ding X, Fu C, Yao X. Nature chemical biology. 2016; PubMed PMID: 26829474. Structural basis for human PRDM9 action at recombination hot spots. Patel A, Horton JR, Wilson GG, Zhang X, Cheng X. Genes & development. 2016; 30(3):257-65. PubMed PMID: 26833727; PubMed Central PMCID: PMC4743056. Contemporary Management of Borderline Resectable and Locally Advanced Unresectable Pancreatic Cancer. Shaib WL, Ip A, Cardona K, Alese OB, Maithel SK, Kooby D, Landry J, El-Rayes BF. The oncologist. 2016; 21(2):178-87. PubMed PMID: 26834159; PubMed Central PMCID: PMC4746088. Factors Influencing Pulmonary Toxicity inÂ Children Undergoing Allogeneic Hematopoietic Stem Cell Transplantation inÂ theÂ Setting of TotalÂ Body Irradiation-Based Myeloablative Conditioning. Abugideiri M, Nanda RH, Butker C, Zhang C, Kim S, Chiang KY, Butker E, Khan MK, Haight AE, Chen Z, Esiashvili N. International journal of radiation oncology, biology, physics. 2016; 94(2):349-59. PubMed PMID: 26853343. Toward Carbon Monoxide-Based Therapeutics: Critical Drug Delivery and Developability Issues. Ji X, Damera K, Zheng Y, Yu B, Otterbein LE, Wang B. Journal of pharmaceutical sciences. 2016; 105(2):406-16. PubMed PMID: 26869408. The relationship of blood transfusion with peri-operative and long-term outcomes after major hepatectomy for metastatic colorectal cancer: a multi-institutional study of 456 patients. Postlewait LM, Squires 3rd MH, Kooby DA, Weber SM, Scoggins CR, Cardona K, Cho CS, Martin RC, Winslow ER, Maithel SK. HPB : the official journal of the International Hepato Pancreato Biliary Association. 2016; 18(2):192-9. PubMed PMID: 26902139.